On October 5th, Ashtari Restaurant & Yoga Shala hosted a charity event for The Lombok Forgotten Children (LFC), Yayasan Endri. LFC is an emergency aid group set up to connect the Sickest of the Sickest, Indonesian Poor, Disabled & often Abandoned Children to help. A donation as small as $100 can be used to connect a child to thousands of dollars of free surgery. We would like to thank all the participants who came to support the mission of Fiona Forrest Foundation and Yayasan Endri. 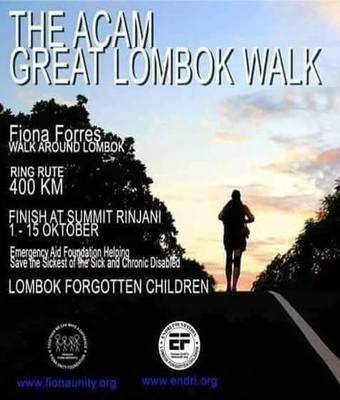 Fiona Forrest Foundation began on the 1st of October 2016 “THE GREAT LOMBOK WALK” and has been walking around the island of Lombok finishing with a charity climb on Mt Rinjani. Throughout this walk Fiona aimed to raise as much awareness and as much fund as possible for The Lombok Forgotten Children (LFC), Yayasan Endri. All the participants were offered delicious food, free yoga class ticket and a chance to win an amazing door prize offered by Kies Villas (2 nights accommodation for 2 people including breakfast). We managed to collect a total of 6 million Rp. through Donation box (special thanks to Tate Developments for their generous donation), Raffles (congratulation to all winners) and tickets. "WHEN OTHERS WALK AWAY, WE DON'T!" 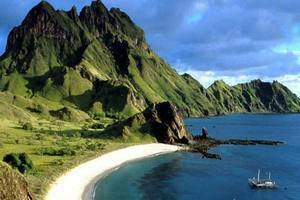 The first phase of Indonesia's tax amnesty program ended on Friday (30/09). Contrary to earlier forecasts the first phase of the program can be labeled a success. The Indonesian government collected IDR 97.2 trillion (approx. 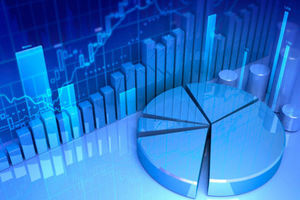 USD $7.5 billion) in additional tax revenue, or 58.9 percent of the nine-month program's full target (IDR 165 trillion). More and more signs point toward a strengthening property sector in Indonesia. In the third quarter of 2016 the property sector has seen more activity, a trend that is expected to continue into the fourth quarter and in 2017. READ Property Sector of Indonesia to Strengthen in 2017? The state-owned firm tasked with developing tourism in the Mandalika special economic zone (KEK) in Lombok, West Nusa Tenggara, says it is currently focusing on supporting infrastructure, including access roads, water treatment facilities and solar power plants. Ownership claims by local residents to 135 hectares of land inside the Mandalika special economic zone (KEK) in Central Lombok, West Nusa Tenggara (NTB), pose a challenge to investment in the designated tourism area. State Enterprises Minister Rini Soemarno has said her ministry and related state-owned companies were striving to avoid overly burdening the state budget in their development of the Mandalika Special Economic Zone (KEK) in Central Lombok, West Nusa Tenggara, although the project may cost up to Rp 3.3 trillion (US$249.06 million). State-owned tourism company PT Indonesia Tourism Development Corporation (ITDC) president director Abdulbar M.Mansoer said the development of the Mandalika special economic zone (KEK), including its grand mosque, in Central Lombok, West Nusa Tenggara (NTB), would hopefully boost tourism in the province. Co-Partner at NagaIndo and Ashtari Restaurant & Yoga Shala, Frenchman Jean-Marc Reynier, has acquired a very good understanding of local affairs over the years but also developed a deep level of network locally and internationally related to Lombok matters. With the huge momentum in commercial ventures since the visit of President Jokowi last December, the demand for qualified personal but also the need for training local staff has increased dramatically. Many business leaders have struggled to find the skills they need. Talents such as construction engineers or architects already exist but try to find a proper accountant, an expert in organic farming or a chef in health conscious dishes. You realise that creating a business here may not be the hardest part actually if you take into account finding the right skills. You can easily imagine how many ventures are in the pipeline but selecting the ones which are feasible today is not an easy task. Jean-Marc Reynier has specialized in consulting for new players to move to the area through its NagaIndo investment vehicle or other more adequate supports. He runs a shortlist of highly recommended investment projects, being in accommodation, food & beverage, outdoor activity, servicing, supply chain or education. Once the resources and timing is right, the project rolls on. If you are interested in making a successful entry to South Lombok market, come and meet us and we will fill the missing dots in your business plan.